At a wedding after party. Got a drink. 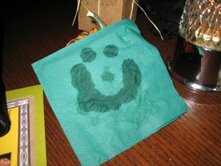 Waitress left it on cocktail napkin. Condensation dripped from glass. I went to pick up my glass and he was staring up at me.